HIGHEST WEEKLY CLOSING FOR bankNIFTY. Bank Nifty opened the week at 26111, made a high of 26148, low of 25356 and closed the week at 25706. Thus it closed the week with a loss of 142points. 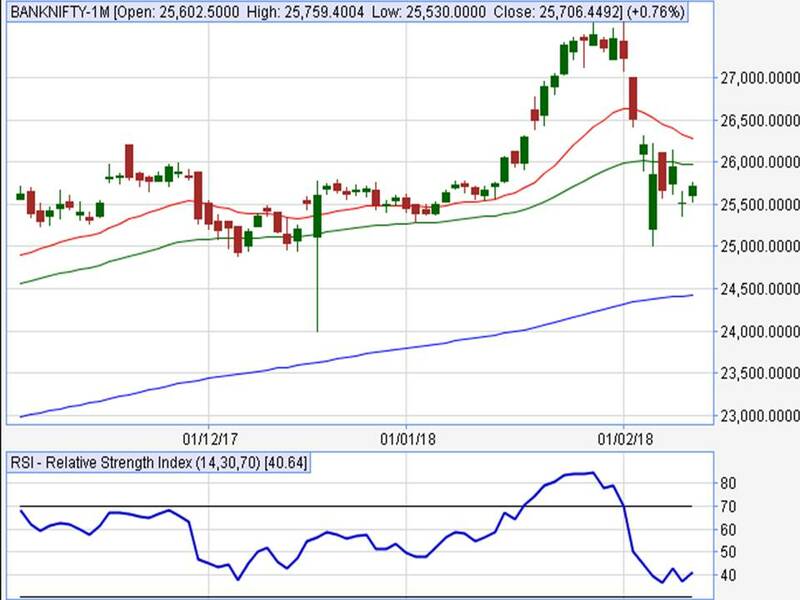 As the bank nifty is managing to trade BELOW its 22 and 55days moving averages with the RSI of 40, one may expect the targets of 25500/25400/25300 in the bank nifty if it manages to sustain below the immediate resistance level of 26000. Technically, BANKNIFTY is still in negative zone until it holds 26000 levels on closing basis.BANKNIFTY would be considered weak below 25800 levels for bank Nifty. BANKNIFTY would see downtrend if it is closes below 25600 levels. Overall, it is strong for long-term but for short term Investors can go short at every rise. Bank Nifty may see some further correction but traders should initiate short only below 25600 levels until then, every downfall is an opportunity to go long in the Bank Nifty. If bank nifty managed to close below 25500 levels.Or breaching this level.bank nifty would force it to move towards 25300-25000-24700-24500 levels.on the other hand The downside pressure will ease only if the banknifty futures manages to close above 26000 decisively. But such a strong bounce looks less probable at the moment. Breakout of its resistance level of 26000 may show recovery in it where traders can expect targets of 26240,26315 and 26500 while major support of 25600 can be placed as technical stop loss. The support for the bankNifty is 25800-26000-26260-26500 and the resistance to the up move is at 25570-25500-25350-25000 levels.